It’s always nice to see an old friend after a long time. To catch up, chew the fat and find out what stories they have to share. 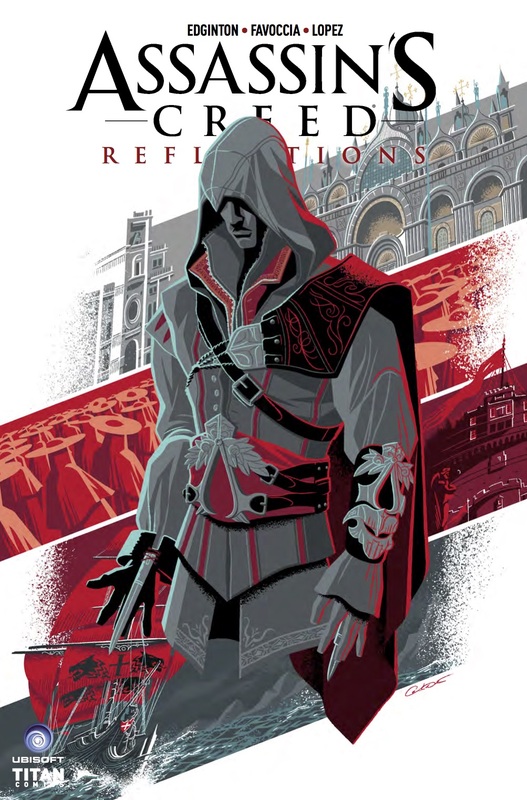 Well in the new Assassin’s Creed: Reflections series of comics from Titan Comics you can do just that, with an old favourite, Mr Ezio Auditore from Assassin’s Creed fame ready to tell us more. The Reflections series starts with Master Templar Juhani Otso Berg who is loyal to the order, but is facing a dilemma…there is a growing dissent from within the Templars and he has set up an organization called The Black Cross to rip out treachery from within the organization. 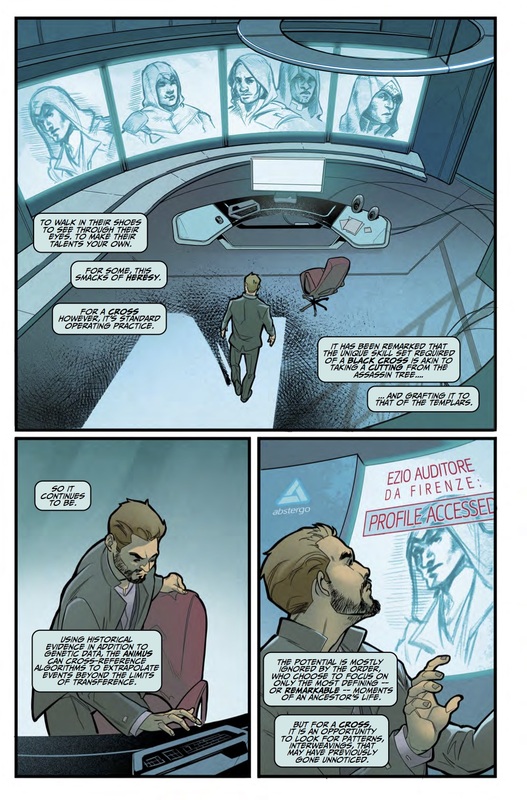 Using Abstergo’s resources with their animus program, he digs into the past of a certain famous Assassin to find alternative methods for implementing the Templar doctrine, by discovering new information and insights. As he himself says, “to truly know one’s enemy is to become him”. We now go to France in 1519, in order to visit a dying Leonardo di Vinci. We find out very quickly that his friend and colleague Ezio is paying him a visit. Ezio is older and the two warmly greet each other with tales of the past. One of these is the main thrust and focus of the story. 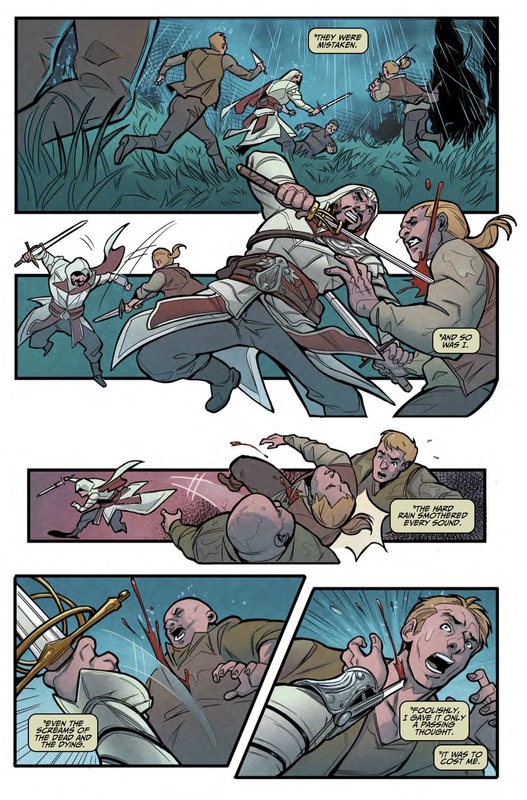 This covers the time when Ezio was between one of his famous adventures, before getting into a massive fight. He is injured and while bleeding badly, blacks out. He wakes up in a barn on a farm, while being cared for by a woman who owns this farm. They get to know each other well, before finding out she’s the woman who sat years later for di Vinci in his famous Mona Lisa painting. We even find out how she got that famous, elusive smile in the painting. As the story finishes and we go back to the future, there is a feeling that the Templars will carry on searching for more sub-stories like this in order to find the truth. some of the previous stories. The old characters are gorgeous while being familiar, and the new additions are interesting and well designed, especially the intriguing Templar master set in the future. The artwork in this opening chapter of the Assassin’s Creed: Reflections series is full of life, with some beautiful shading and coloring. The feeling is vibrant and fun, with no dark brooding shadows lurking in the frames. The actual frame design and storyboarding is excellent, with particularly the actions scenes bouncing with life from the page. Overall there is lots to rejoice about this new comic book series from Titan Comics. The story and plot is a joy, with its interesting main narrative thrust and the promise of a great bunch of Ezio stories in the offering. The artwork is cool and vibrant, without being groundbreaking and the storyboarding and frame selection is great. So it’s a superb start to this new series and I am looking forward with baited breath for issue number two.